By Friederike Fabritius, M.S. and Hans W. Hagemann, Ph.D.
Kaizen — the simple, small technique for tricking your brain and developing a new habit. Of course, even with clear goals, great expectations, and a carefully plotted-out plan, many of us who seek to develop new habits or jettison old ones run into an immediate obstacle: One of the most difficult parts of changing is just getting started. That’s why the best time to start is right away. Procrastination is the principal impediment to initiating a habit change. Large goals can seem intimidating unless broken into manageable steps. Kaizen, the practice of using small steps, can help you to avoid the threat response that frequently drives procrastination. Although the kaizen technique is strongly associated with Japan, it actually originated with the U.S. military. Using the mantra of “continuous improvement,” the idea was to make modest but steady alterations in how the Japanese businesses were run. The approach, which came to be known as kaizen in Japanese, was implemented widely and embraced enthusiastically by industries in the island nation, who would ultimately use it to transform Japan into an economic powerhouse admired throughout the world for the efficiency of its production and the quality of its products. 2. Think small thoughts. Now that you’ve answered your question, it’s time to visualize yourself acting on it. The principle of “mind sculpture” suggests that the brain learns better in small increments instead of large doses. If you isolate a task that you are afraid of or that makes you uncomfortable and then gradually — very gradually — visualize yourself beginning to work on it, over time your mind’s attitude toward the once-dreaded task will be reshaped. 3. Take small actions. Small questions and small thoughts ultimately require small actions. The executives we coach frequently ask too much from their direct reports. The goals they set for their employees are often too large. As a result, both parties wind up disappointed and demoralized. Never make target agreements like this: by the end of the year, you’ll regularly make ten phone calls a day to customers. Instead, here’s what we typically advise: ask the employee to make one call per day in the first week, two calls in the second week, and so on. Meet regularly to see how things are going. It should be easy to add one call per week, every day. The key is to continue to make steady progress. 4. Solve small problems. Negative self-talk will rarely be successful in convincing you to make changes. Ask yourself whether mistakes you make are part of a bigger problem. If you can peg the error to a larger issue, you’ll give yourself further incentive to work on it. 5. Give small rewards. Most of the habits we engage in were originally triggered by the expectation of some sort of reward. The small reward you choose for habits you are attempting to change or develop should be appropriate to the goal. Although it may sound counterintuitive, small rewards can often be a greater source of motivation than large ones. 6. Identify small moments. The little things can sometimes mean a lot. Often people who notice what seem like inconsequential details find that they can lead to dramatic results. In the factory of one of our clients, the workers were upset by the inaccessibility of their boss. They complained that they never knew when he was in and were annoyed that they always had to go through a secretary to speak to him, even for trivial matters. What we discovered was that he was using a separate entrance to get into his office each day. That maneuver may have saved him about twenty yards of walking, but it rendered him virtually invisible to his employees. We suggested that he lock the back entrance of the office so he was compelled to walk the extra distance through the factory floor every day in order to get to his desk. This small change had a huge impact on company morale. Each day began with pleasant greetings and smiling faces. The boss was frequently able to solve little problems and provide quick advice as he headed to his office every morning. Taking a different route may have added five to ten minutes to his walk, but the investment in time paid off dramatically in the next worker satisfaction survey. Maurer, Robert. One Small Step Can Change Your Life: The Kaizen Way. New York: Workman Publishing Company, 2014 (Kindle edition), preface. 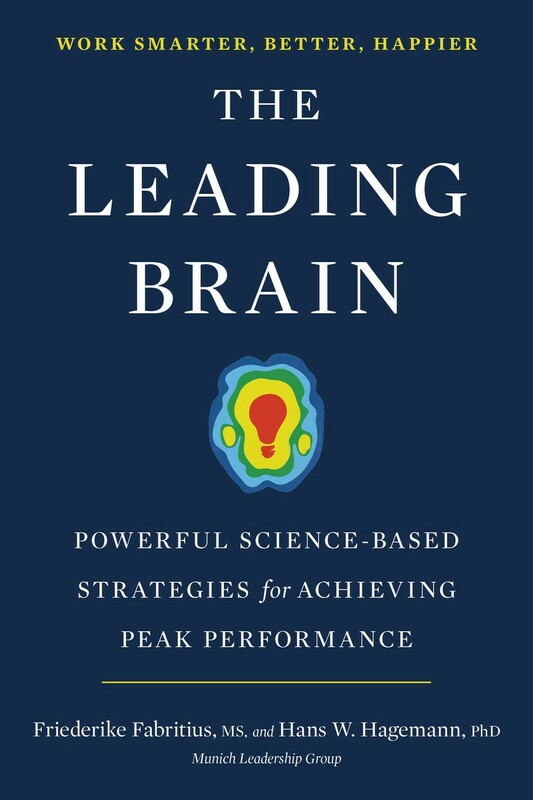 Adapted with permission from THE LEADING BRAIN: Powerful Science-Based Strategies for Achieving Peak Performance by Friedericke Fabritius, M.S. and Hans W. Hagemann, Ph.D. © 2017 by Friederike Fabritius and Hans W. Hagemann. TarcherPerigee, an imprint of Penguin Random House LLC.